Android: How to enable Dark Mode on Google Maps. Many of your favorite apps and OS’ like YouTube, Twitter, Chrome and even Windows etc. already have it. The good news is that Google Maps already supports a “Night” mode, which turns the navigation interface dark. However, it takes a bit of a workaround to get it to work. Here’s what to do. Go to Maps Settings. Swipe the menu from the left-hand side of the screen, then tap “settings” towards the bottom of that list. Scroll to “Map Display” and change the Color Scheme setting. By default, the dark mode feature is set to automatic which toggles the color scheme off or on depending on the time of day. 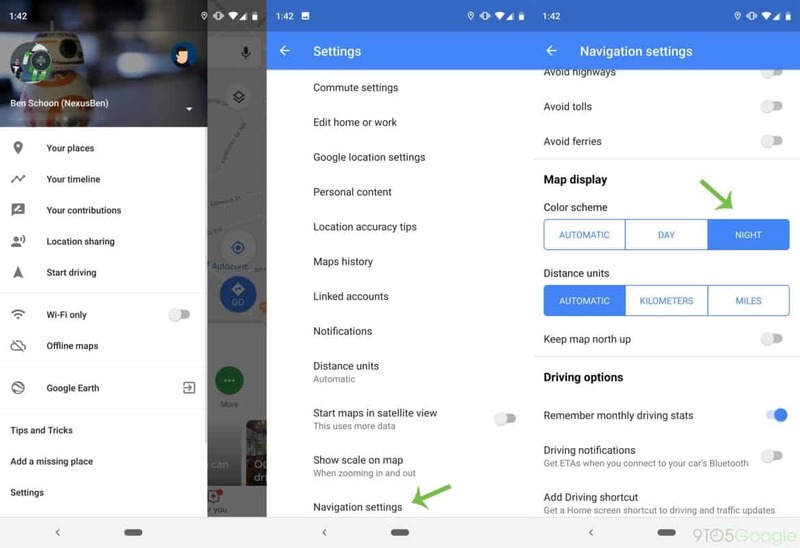 Once you choose the Night option as seen in the image below, Google Maps will appear a dark theme on your Android.